As the U.S. auto industry plateaus, Tower told investors exactly what they wanted to hear: North American revenue remains robust. 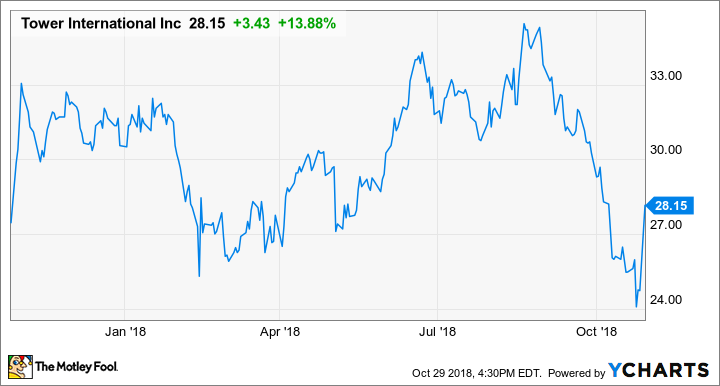 Shares of Tower International (NYSE:TOWR), a manufacturer of structural metal components and assemblies for the automotive industry, are up nearly 14% as of 4 p.m. EDT Monday, after the company released strong third-quarter results. Tower delivered solid financial results in the third quarter, growing revenue organically well in excess of the overall auto market and expanding Adjusted EBITDA margins. Revenue for the quarter increased 14 percent as Tower continues to benefit from the secular trends of outsourcing and a continued production mix shift from cars to trucks and SUVs. Tower's North American revenue continued to significantly outpace the market, growing by 20 percent from a year ago. Management has put together a strong year; it paid down $50 million of term loan debt, and continued to return value to shareholders by increasing its quarterly dividend to $0.13 per share. But the biggest takeaway, especially as new-vehicle sales in the U.S. plateau, is that its North American revenue continues to climb significantly more than the market. In fact, through the first nine months of 2018, the company's North America revenue increased 17% compared to the prior year -- while industry production declined by 1%. That's exactly what investors needed to hear in the near term.